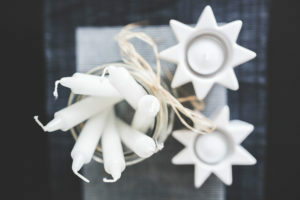 In the quest to build a healthier more long-lasting candle, I have been delving into the world of soy candle wax. Everyone’s doing it, right? But I admittedly knew very little about why people are making the switch. What makes soy candle wax so much better than regular ‘ol paraffin and why is it worth the extra cost? Well, my friends, let me tell you. The more research I did, the more I realized that unless you want black lung, you gotta make the switch! Well, maybe not quite, but close. I knew that regular cheapo candles are made with paraffin but what I didn’t know is what the heck paraffin is. Turns out, it’s a by-product of making petroleum. Want to know why you get that funky black smoke when you burn your cheap commercially made candles indoors and why they stain your walls black? It’s because you are basically burning a petroleum by-product in your house. With a cheap, synthetic wick. And breathing it in by the way. So uh, no thanks. I’ll stick to making my own candles with soy wax and cotton wicks from now on. Guess what soy wax candles are made from? SOYBEANS! Admittedly, soybeans are likely to be genetically modified since they primarily come from the US, but I do still like the idea of support farmers rather than oil conglomerates through my candle making ventures. So with that in mind, I bring you the 4 best soy waxes for candle making.